The former chief of U.S. Border Patrol said there has been a 50 percent increase in illegal immigrant gang members coming into the United States this year. “As an example, last week, three MS-13 members who were arrested in Maryland for stabbing a rival gangster and burning the body were resettled basically as refugees under the false pretenses of being brought to this country as ‘unaccompanied minors.’ Unfortunately, this isn’t an isolated example,” Mark Morgan, who headed up Border Patrol from 2016-2017, said in testimony on April 4 before the Senate Committee on Homeland Security and Governmental Affairs. Loopholes in federal law will result in some 650,000 illegal immigrants being released into the United States this year, a former Border Patrol chief said. “Long Island and Maryland became hot spots for MS-13 activity during the surge of Central American teens in 2014. The number of teens coming in now, both individually and with families, dwarfs the 2014 numbers,” Morgan said. Morgan warned the committee that loopholes in federal law will result in some 650,000 illegal immigrants being released into the United States this year. Most will “never to be heard from again,” he said. Morgan said that the U.S. isn’t sure of the background of those entering through the southern border. Committee chair Sen. Ron Johnson, Wisconsin Republican, blamed Congress. 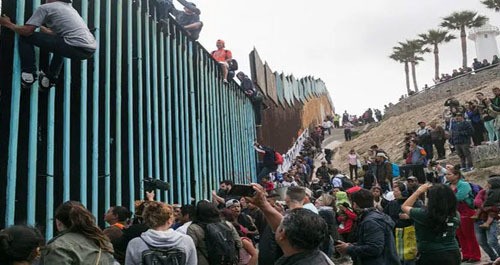 In one 12-day period – March 21 to April 1 – DHS released over 17,000 border crossers and illegal immigrants into the interior of the U.S., Breitbart News reported, citing newly obtained data. Since December 21, 2018, DHS has released about 125,565 border crossers and illegals into the interior of the country. 12,745 border crossers into the San Diego, California area. 22,000 border crossers into the Phoenix, Arizona area. 37,500 border crossers into the El Paso, Texas area. 53,320 border crossers into the San Antonio, Texas area. The crisis could reach nearly unprecedented levels between April and June, Princeton Policy researcher Steven Kopits told Breitbart News. To put that rate of illegal immigration into perspective, there were less than 400,000 arrests at the U.S.-Mexico border in the entire Fiscal Year of 2018.